I am writing some posts for a wonderful blog called the ‘logBLOG‘ during the summer. The first article can be found by clicking here. My recipe is below, highlighting the amazing zucchini found in San Remo, Italy. Cut zucchini into 1″ slices and dice onion. Heat a stock pot over medium heat and add butter to melt, then sauté onion until translucent (do not color). Add zucchini and sauté for about 5 minutes (again, do not color), afterwards adding just enough water to almost cover. Bring to boil, then immediately cover pot with plastic wrap or lid, reducing heat to simmer for approximately 45 minutes. Check that flesh is tender but not falling apart then put into food processor, with half of the cooking liquid (reserve remaining cooking liquid to thin if necessary later). Once thoroughly blended pass through a strainer to get a more smooth texture. You can add cream, salt and pepper to taste now. Place in bowl into refrigerator to cool. When serving, drizzle with the unfiltered extra virgin olive oil. Season the cheese with salt and pepper to taste. The zucchini blossoms can now be filled with the local cheese, only fill halfway. Dip the blossoms in milk and then gently roll into the flour, being sure to shake off as much as possible (though it’s not local, if you have tempura batter it is a great substitute). In a fry pan, fill with 1″ of oil and heat to medium heat. Make sure oil is not smoking, that means the oil is too hot and you should pull pan off to cool a bit before adding blossom. Add the blossoms and turn about four times, letting the exterior cook to a gold color. 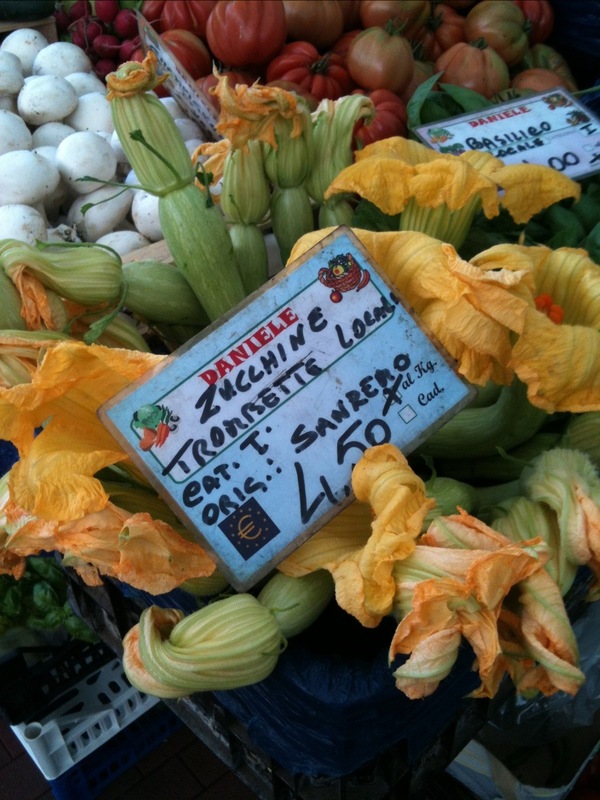 This entry was posted on 20/06/2012 by RuedOdessa in Cheese, Italy, Markets, Products, Yachting and tagged Blossoms, San Remo, Soup, Stuffed, Zucchini.